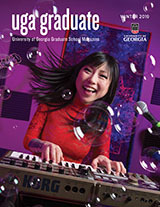 Graduate students have a variety of opportunities to travel abroad utilizing UGA organizational structure of Study Abroad programs, residential sites, collaborative agreements with partner institutions, affiliations with consortia and other research and professional networks. Our Residential Sites offer unique opportunities for interdisciplinary courses and graduate work. For instance, in the Ecolodge San Luis and Research Station in Costa Rica, students can develop field techniques, initiate preliminary research projects or receive training for field methods as well as language and culture. In Cortona, Italy, there are options for internships in Art and courses dealing with art history, art studios in a variety of disciplines. In Oxford, England, the residential site serve students affiliated with the Oxford program serving various schools and colleges. Many academic collaboration programs allow graduate students to take part in special projects developed through the Area Study centers (such as the Center for Latin American Studies, the Center for Asian Studies, the Institute for African Studies) or specialized centers (such as the Center for Tropical and Emergent Diseases, the Complex Carbohydrate Research Center, the Center for International Trade and Security, the Center for the Study of Global Issues). Many graduate students can apply to participate in a variety of research projects conducted by UGA professors overseas, and will be eligible to apply for partial funding to participate in international conferences or workshops if presenting a paper. There is an International Graduate Students task force within the Graduate Students Organization that works with the Office of International Education to meet the needs and wants of international graduate students on campus. Once international students are admitted to the Graduate School, OIE serves in orientation, review and maintenance of visa status as well as travel authorities, on-campus job authorization and optional practical training after graduation, as required by law.